I am continuing to recover from an excruciating lower backache I recently suffered as a result of taking a walk on the wild side via my bathroom where I adjusted my shower head, an action that has only impaired my ability to stand, sit, stair-climb and sleep, but mercifully, I still have the capacity to swear like a rapper, a skill I recommend honing, particularly when in agony and walking stiffly on the Upper West Side in a semi-incapacitated state. Me: Hey Beret Man, you’re not in Nairobi. One way to ensure that the beret stays put. 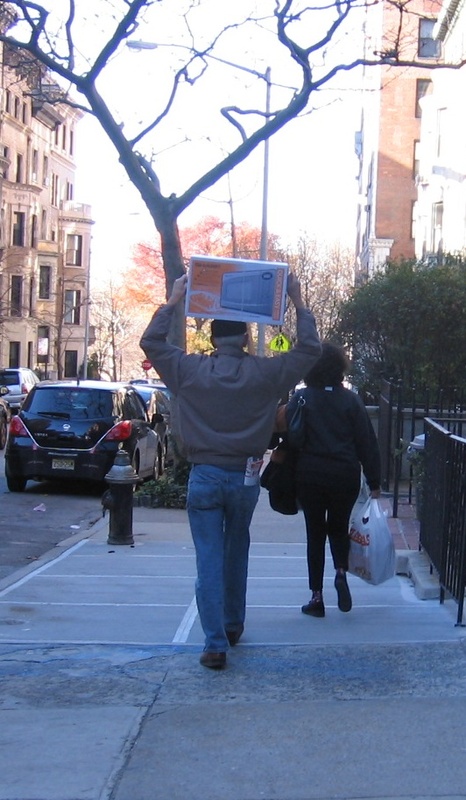 How safe is it to carry objects on the head? I originally considered Google searching, “How safe is it for a Westerner wearing a beret to carry a toaster oven on the head,” but I decided a more generic search might yield the answer I was seeking. I highly doubt that Beret Man has developed that gait, and right now, I’d rather have my slowly healing aching back than his compressed neck. Next time, when fleeing Zabar’s with something big and bulky, break out the wallet again and invest $5 in taking a taxi to the car. This entry was posted in Humor and tagged backache, head-loading, toaster oven, Upper West Side, zabar's. Bookmark the permalink.